Steven (Chicagoland, United States) on 7 December 2016 in Plant & Nature and Portfolio. The "Dryad's Saddle" fungus, a.k.a. "Hawk's Wings", spotted in Gilbert Park in Downers Grove, Illinois. 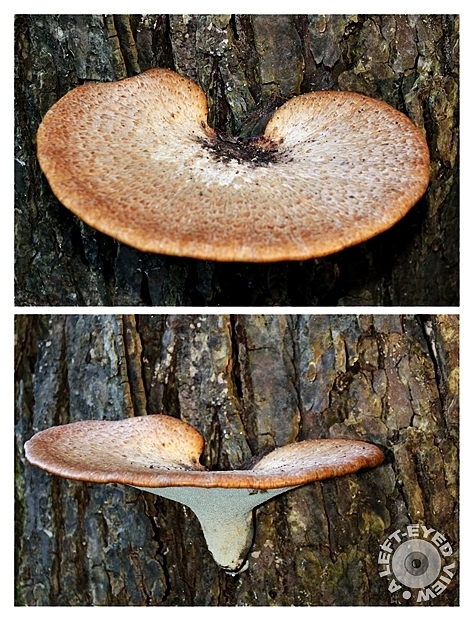 It is a basidiomycete bracket fungus, with common names including pheasant's back mushroom as well. It has a widespread distribution, being found in North America, Australia, Asia, and Europe, where it causes a white rot in the heartwood of living and dead hardwood trees. The name "Dryad's Saddle" refers to creatures in Greek mythology called dryads who could conceivably fit and ride on this mushroom, whereas the pheasant's back analogy derives from the pattern of colors on the bracket matching that of a pheasant's back. Photo captured October 22, 2016. Quel champignon sur ce tronc quelle vue merivelleux. Great pair of photos, I remember these mushrooms in the woods in Canada. A new one to me . . fungi are fascinating and kinda mysterious. Excellent montage montrant deux aspects du champignon. Splendid capture of the fungus . Two very fine examples, shot perfectly to offer different angles. I see a lot of specimens in the Elora Ontario woods where I spend so much time walking the river gorge. Wow! Excellent capture! The mushrooms look as if they were put there on purpose. For me, it's a big pancake. Very nice find and good work. I am happy you showed two angles. What a beautiful shape and pattern. Very good images of this fungus. Beautiful shots of this fungus. haha - I didn't know Wednesday was fungus day. Perhaps I could have ordered my daily selections better. And you provide a double dose. I love it. It is a little forest table.